Today is the first birthday of Penguin says Feed Me and we're celebrating with a new banner and PIE! It really does not feel like it's been a year since I started this humble blog of my eating adventures, and I still remember starting up this blog and writing up the very first post thinking that no one was going to read it anyway. I never in my dreams thought that anyone would even read my blog, let alone meeting new people through it, but probably one of the best parts about blogging is meeting and forging friendships with the other awesome Sydney food bloggers (I love you guys!). One new thing that I've learnt to do is make pastry from scratch. 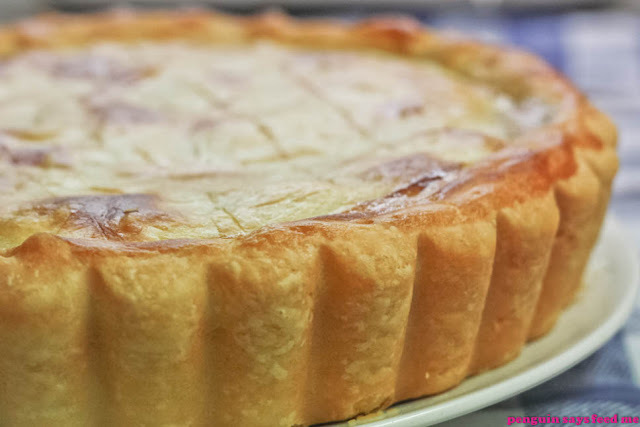 When I first started this blog, making pastry from scratch seemed like the most daunting task - I mean, isn't pastry something you buy from the freezer aisle in the supermarket? But once you get the hang of it, it's not difficult at all, and it is truly satisfying when you can proudly present a pie or a tart and say that you made it all by yourself (or in this case, with the help of Sir D). EDIT: Just realised this is also my 100th post! 1. Preheat the oven to 200°C. Season the chicken marylands with salt and pepper and place in a buttered baking dish. Roast for 20-25 minutes, and rest for 15 minutes. The meat should still be slightly pink. Discard the skin, remove the meat from the bones and shred. 2. Heat the chicken stock and reduce by one third. Meanwhile, in large saucepan, fry the mushrooms in butter, sprinkling flour over them and stirring to coat evenly. Gradually stir in the hot stock and cream and simmer gently until thickened. 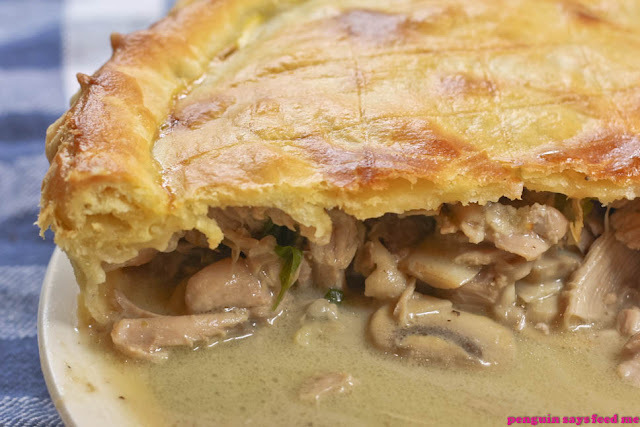 Remove from the heat, fold chicken meat and herbs through mushroom mixture and season. Refrigerate until chilled. 3. Increase the oven temperature to 220°C. To make the pastry, pulse butter and flour in a food processor until it looks like coarse breadcrumbs. Add the sour cream and continue to pulse until the dough starts to incorporate into a ball. Divide the pastry into two portions, with one twice as large as the other. Wrap in plastic film and refrigerate for at least 20 minutes. 4. Make the egg wash by mixing the egg and milk together with a good pinch of salt. Take the larger portion of pastry and roll to 3mm thick. Cut to line the base of the pie dish, leaving a ‘lip’ over the edge. Brush the 'lip' with egg wash and fill the pie with chicken mixture. Take the remaining pastry and roll out to 3mm thick, and cut a circle for the lid. 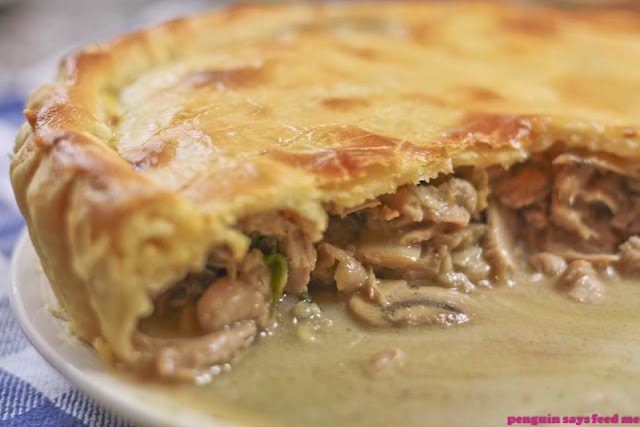 Place on top of the chicken mixture, fold over the bottom pastry 'lip' and crimp the edges to seal, trimming off any excess pastry. Score the top of the pie and brush with egg wash. Refrigerate for 5 minutes. 5. 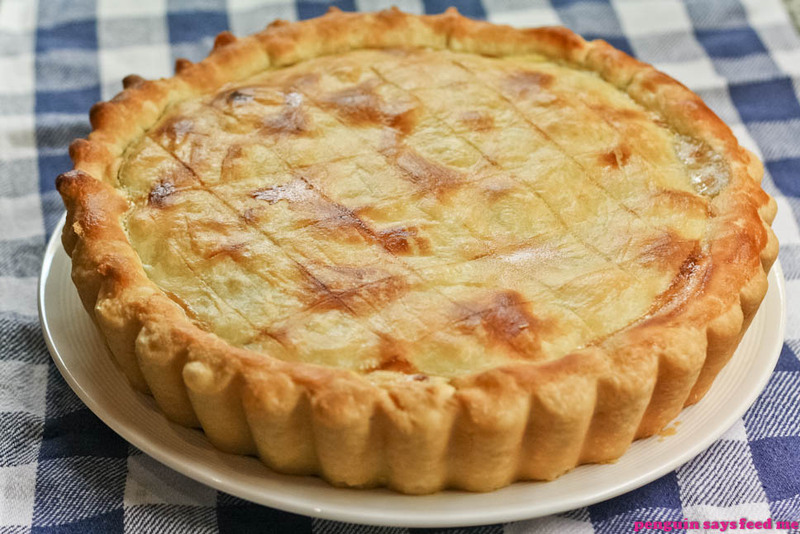 Remove pie from the fridge and bake for 10-15 minutes or until the pastry is turning a light golden colour. Reduce the oven temperature to 180°C and bake for a further 30-35 minutes until the pastry is golden and cooked through. Cover the top of the pie with foil if your pie is browning too quickly. For an even colouring of the lid, turn the pie halfway through cooking if desired. Happy bloggaversary! Oh my that pie looks amazing with the flakey puff pastry! I admire whoever make their own pastries. The new banner is so cool! minh's penguin is awesome!!! woohoo happy blogiversary jacq! a year has absolutely flown by and im glad to have gotten to know you both online and in real life! Congratulations on a successful year! The pie is just the thing for celebrating - but where's the candle? Congratulations Jacq! And well done, this pie looks delicious! Your pie looks perfect Jacq! Congratulations on all those milestones! Love the new banner & cute little knitted fella too. Hehe that banner looks familiar! Congrats on your anniversary and 100th post!! Congratulations on your 100th post! Love your little knitted fella, the pie looks so good too! The pie looks utterly gorgeous! Happy 1st birthday!! Looking forward to many more delicious posts!! Hi Helen - Thank you! Maggie Beer's sour cream pastry is definitely one of a kind so she has a right to wax lyrical about it :) And thank you for being one of those people with the kind souls and big hearts! Hi Betty - Thank you! Sending lots of <3 your way too! 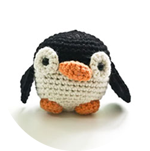 Hi Minh - Hehe thank you for providing a little cuteness to my blog! If only I could knit/sew like you! Hi YaYa - Thank you! Hi Stephcookie - Well it is Maggie Beer's pie so it has to be good right? Thanks Steph! Hi Simon - Thank you! Hi Ellie - Thanks so much Ellie! Hopefully there will be another year's worth of deliciousness to come! LOOKS DELICIOUS I WANT TO TRY IT.